Lima Cotton Lawn Printing. Custom Printed Cotton Lawn Fabric. This is a tightly woven hybrid material, with a plain weave construct. It is a very smooth, cool, durable, and lightweight material. It has a good drape, with a soft surface. Cotton Lawn Fabric Printing has been popular for a long time, and is often used for summer clothing items because it is so light and breathable. It is often used for summer clothing as it is so light and breathable. A hybrid fabric which comprises of 73% cotton/27% poly, meaning it has a cotton base which has been fused with a poly face. 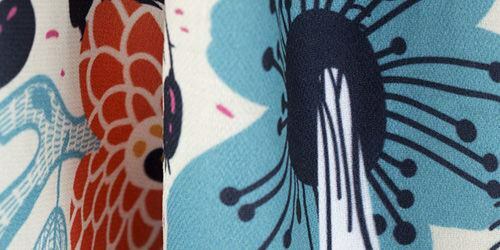 Your design is hand printed deep into the fabric to produce a beautiful, permanent print. This custom printed Cotton Lawn fabric is one of our Lima Cottons, and has been perfected for the printing process. We strive for the brightest, longest lasting colors and achieve them with our dye sub process. The front texture of the fabric is very soft and has a gentle delicate surface. The back texture is still very soft, just not as fibrous and has more of a nice easy feel to it which would feel at home in many uses. The drape is quite natural, and falls easily around the hands. Though it is a thin material it holds its shape well while in use, without being stiff. The base of the Lima cottons have a matte finish, with a natural, light ivory tone, which will give your prints a warm and slightly yellow hue. A great fabric choice for bold prints in yellow based colors. The main selling point for these materials are the intensity of the color they produce. The cotton is coated with a new and improved sub style printing technique which leaves long lasting durable colors that are bright, vibrant, and have a superior contrast. Our fabric printing is guaranteed to outlast pigment printing and the detail in the print quality is very precise and clear, making it perfect for very meticulous designs and patterns. Beautiful Work Everything about this process was amazing. Your prices were excellent, I placed my order late on a Friday and took delivery on Tuesday on a different continent. The print was incredible. The detail in the resolution was perfect and the sizes fit into our existing structures exactly as they should. I couldn't be happier with the results and I have already told all of my theatre friends to give you a look. Thanks! Great Work!!! we ordered two canvas printed panels and they turned out great. quick turn around. fast delivery. terrific value. 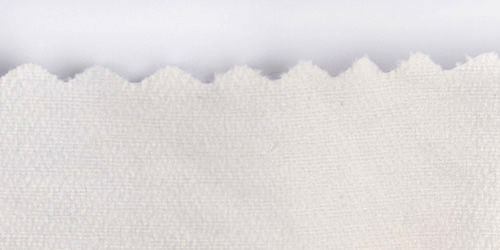 What Is the Difference Between the Lima Cotton 'Poplin' and the 'Lawn'? There is little difference between the Poplin and the Lawn. The Lawn weighs 3.1oz of cotton and 1.2oz poly, making it slightly more transparent, and the fabric is slightly elastic with marginally more give in every direction. Aren't Lawn Cottons Usually Stiff? Some more traditional Lawn Cottons are stiffer, as they are sometimes treated with a light starch, however ours are softer due to our printing process. The Lawn still has it's other traditional qualities, such as it's weight and breathability. With it's slightly more structured back, the fabric does have the ability to crease, but it is safe to iron on a low heat if you want to get rid of those annoying lines and folds.